It is four right angles and four seams sewn with an opening for my head. No, really. I know it looks like much more, but the fabric and the elasticated waist are doing all the work. I’ve made this dress twice before (once in a peacock print and once in navy) during my half year of speed sewing for The Sew Weekly blog, but I never wrote about it here. Until now. This version has an upgrade: A circle of clear elastic sewn to a dropped waistline. When life (in the shape of a lingering cold, surprise deadlines at work, and family travel plans) started creeping in on my intentions to make something wearable this month, I fought back by resurrecting the simplest, self-drafted shape and applying it to the rayon challis print I acquired during my past addiction to online fabric sales. My first two iterations of this dress were cut and sewn directly from yardage. This time, re-realizing how many more dress and top variations this shape could yield, I made a pattern. I was grateful for the accuracy that one rectangular pattern piece gave me when trying to fit the front and back on the full width of the fabric. I had to short the seam allowances a bit on one seam, but ended up with an almost zero-waste garment. The dress in my head got sketched on my croquis to see how the sewn-on elastic would handle the volume and how much blousing I’d like. I wanted the dress to be permanently bloused at the waist versus just having the extra fabric belted. The elastic would keep things in position and distribute the gathers evenly like it did in the men’s shirt I refashioned last year. However, a happy accident with the untested marking of my real vs. dropped waistline gave me more blousing than I’d planned. But, I kinda like it! Its 1980s material girl meets 1920s flapper. I constructed the dress over three days. On day 1, I ironed and cut the fabric. On day 2, seams were sewn and overlocked. On day 3, the elastic and hem went in. To create the blousing, I quarter-marked and zig-zag stitched clear elastic to a waistline marked 1.5 inches below my true waistline (which turned out not to be). To keep the back hem even, I lowered the back waistline by half an inch at center back. I canNOT get over the basic beauty of this dress shape. The amount of pattern play to be had is endless. My next one might get kimono sleeves and a rounded hem. A proper neckline might even get drafted on future versions. My satisfaction meter is off the charts with this make. Not to mention that I may have stumbled upon my fall/winter uniform. What’s your experience sewing boxy styles? Would you ever try a dresstangle? What other variations do you see are possible with this shape? I finished my drafting experiment in curved darts. But only after letting my mind marinate on the construction steps for several nights. The aha! moment was TINY SEAM ALLOWANCES. To sew the curves accurately, I couldn’t treat them like typical waist or bodice darts by folding in the intake. I had to treat them like seams. And since there wouldn’t be enough room for my usual 1-inch (2.5 cm) seam allowance, I marked the allowance that fit each dart – in some places it was as small as 1 cm. In my original draft, I slashed and spread the skirt back so it could be gathered into an elastic waistband. When I got ready to cut it out of muslin, there was too much volume in the pattern piece. I realized I meant to add the volume to a full front piece, so I re-drafted the back and cut it out. To complete my basted fitting sans waistband (which will be straight and cut-on, with interfacing in the front and elastic in the back), I gathered the back with 3 rows of stitches in the seam allowance that met in the center. I tried on the skirt mockup in a hurry before work. I put it on backwards, pulling the six bobbin threads to cinch in the gathers, then turned the skirt around properly to check the fit at the side seams and evaluate the short hemline. To contain my excitement for the success of this drafting experiment, I have decided to procrastinate on fabric selection. I think this skirt is asking for a solid woven with some body, but nothing too drapey. In my collection are a few solid linens, a black silk dupioni, a couple of gabardines, and a silk/cotton blend. I will try to choose one of those to start, but I’d love to get recommendations from you. The start of a curious joke? Or the list of accessories for the paisley knit tank top I made? It’s the latter, of course. Though a suitable punchline for my setup is still a goal. With help from a quirky, patchwork paisley printed stretch knit, I executed the binding technique I wrote about in July to sew a companion for a chambray dirndl skirt that waited a year to be hemmed. Even though I still have to draft new sleeves for it, my beloved fitted t-shirt pattern (debuted here last winter) is officially operating as a block now that I’ve got the shoulders and armholes fitting just right. I traced it to create a tank top pattern with a lower neckline. Unfamiliar with drafting for knits, I referenced my Helen Joseph Armstrong book. The section on patterning kids clothes made with knit fabric covers how to measure and plot a lowered neckline. Had I attempted it on my own, I wouldn’t have accounted for the bit of contouring that seems to build in just the right amount of negative ease at the chest. The position of the neckline on this tank top is EXACTLY where I want it. Plenty of skin showing to give the eyes a place — other than the obvious one — to land. With a shape that isn’t too scooped…but soft and rounded. Like my hair. Which I styled carefully for a look in the middle of the spectrum between Angela Davis and Pam Grier. Examining the symbiotic link between neckline and hair shape… is for another blog post. Let’s enjoy a photo collage tribute to binding construction instead. From left to right: (a) When I sew wovens, I cut patterns from a single layer of fabric. For this pattern, I folded in the selvedges to the middle and used my rotary cutter. (b) The 45 degree line on the grid of my cutting mat and chalk-marked stitchlines kept the mitered seams of my binding looking sharp. (c) I know it’s overkill, but a steamy iron and my tailor board got in on the action. (d) I always get a little nervous before attaching freshly cut bindings. Did I get the ratios right? I can usually tell if I’m off by laying the seams next to each other. About the skirt. My usual dirndl. It’s origin story is ancient. 95% of it was sewn over a year ago! I even lined the skirt and the pocket and Instagrammed my results to the world before noticing there wasn’t enough fabric for the waistband. A small tear was shed before I hung it up in a corner to display it as an unfinished object (UFO) in distress. Lined denim pocket or smiling muppet mouth. I picked it up a few months later after I learned a machine sewn technique for interfacing a waistband with petersham in my Skirt Skills class. I tried it out on a straight waistband cut from bottom weight denim that happened to match my chambray. After admiring the results, I abandoned the dirndl AGAIN so I could use the denim to sew that game-changing pencil skirt. By the time I returned to finally hem and fasten the chambray dirndl (last week), it was three seasons later and I was ten pounds lighter. If its muppet mouth could speak, it would’ve cursed me out. Even though the waistband was a bit thicker than I’m used to, and the hook placement had to be sewn an inch deeper, the peterhsam interfacing performed like a champ. My waistline did not grow like it did in the un-stabilized, chocolate linen maxi version of this skirt. After a day of wearing and eating, and through the weight of keys and phones in pockets, my waistband was a solider. These separates are a uniform silhouette for me that leave me feeling comfortable and confident. I may not be able to craft a swift punchline for a joke, but I can certainly craft a slow, wonderfully wearable outfit for my body. My husband does all the laundry and is pretty strict about what gets done first. The bolt of muslin I put in the queue did not get VIP priority. So, with less than a yard to work with, I cut out only the front and basted in the pleats of the self-drafted skirt pattern I shared earlier. The process revealed that I’d forgotten to fold and true the pleats in paper, leaving no room for turn of cloth. The laundry delay was either serendipity or clairvoyance, because I’ve got another patterning playdate before I’m ready to lay down my iron upon a mile of clean muslin. Speaking of playdates, I just registered my three-year old for preschool. All of the feelings and paperwork involved remind me of sewing. I was glad to rediscover Christine’s thorough instructions for drafting and sewing a knit peter pan collar. Portia’s jeans refashioning challenge has me mapping out thrift stores to stalk. The hilarious review of Fendi’s 2017 resort collection on the Pretty Grievances blog features a pair of wider than wide culottes that I should’ve laughed at but actually enjoyed. My neighborhood pool closes in a week, so I missed my chance to make a new swimsuit —but next year…Amanda’s legendary Wonder Woman bathing suit (with drafting instructions) will be my guide. I recently updated my about page. If you’re a new follower, the short recap of the key turning points in my sewing life should be a nice Wanna Be Sewing Something primer. I drafted a pattern during my lunch break. No food. No phone. Just my supplies and the sketch of a mini skirt that my mind wouldn’t shetup about until my hands got to work. The skirt I wanna-be-sewing has four, topstitched darts that radiate from the waist toward the side seam. To get there, a little slashing, a little spreading, and maybe later….a muslin mockup of the final pattern to play with dart length and spacing. I started with with my skirt block. This version is only 3 months old and already full of pin holes. I traced a full copy of the front and drew in the new hemline. I got cold feet about the mid-thigh length and found myself hesitating to cut off the excess right away. The back will have a dirndl look with elastic inserted into the back waistband to make it a pull-on skirt. To create this, I evenly spaced and cut four vertical lines, numbering the remaining pieces to keep track of them before spreading them apart to 1.5 times the width of the original hemline. Using a bendable ruler and french curve, I plotted four, parallel curves across the skirt front. Then, I held my breath…and slashed through each line. Washi tape holds the closed darts together. After drawing in the curves for the darts, I realized they could easily be sewn as pleats. Which means I could have TWO styles for this pattern if I squared off the dart legs. I did this and they became match points for four asymmetrical pleats. During my next pattern playdate, I will finish labeling all of the pattern pieces. Then, I’ll trace a copy of the pleat-ready front pattern, draw in the stitchlines of the four darts I originally planned, and cut out the dart intake. 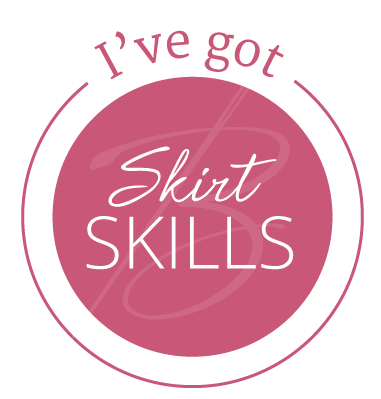 In my Skirt Skills class (aka couture for beginners), I learned to sew from stitchlines vs. cutlines. So my pattern will remain seam allowance-free, allowing me to mark the stitchlines directly onto the fabric. A straight front waistband (that will double as a separate facing) was drafted to accompany the elasticated back waistband. Before I test out the pleated and darted versions of this pattern in fabric, let me know what you think. Have you ever sewn or designed a garment with asymmetric seams? This will be my first!